Clackamas, Ore. – Eat more fruits and vegetables. You've heard the advice before to improve your health. But how long will it take to see a change? Weeks? Months? Try eating a plant-based diet for just seven days and measure the results with a health risk assessment. 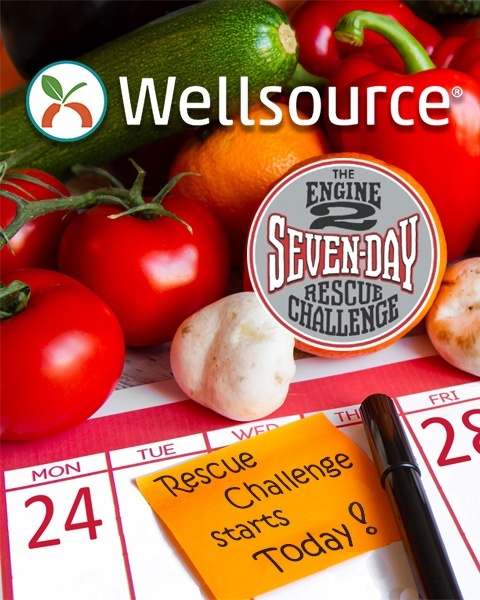 Wellsource, Inc., a leader in designing cloud-based population health tools, is excited to announce its collaboration with Engine 2 on the Engine 2 Seven-Day Rescue Challenge. It’s a week-long program designed to promote optimal health through plant-strong nutrition. Together, Wellsource and Engine 2 aim to promote the power of personalized health transformation. Wellsource is providing online access to its WellSuite® IV Health Risk Assessment for up to 10,000 Challenge participants. The Challenge will run from April 24 through April 30. Engine 2 Seven-Day Rescue Challenge participants will securely access the Wellsource cloud-based WellSuite IV Health Risk Assessment via special log-in. After answering a short series of questions about their lifestyle habits, each participant will see their health scores and any risk factors for preventable diseases such as diabetes and heart disease. The WellSuite IV Health Risk Assessment takes less than 15 minutes to complete and can be taken on a desktop PC, laptop, tablet, or smartphone. The question set has been developed on the basis of published research and helps show the connection between lifestyle habits, health status, and chronic disease risk. The questions adapt to an individual’s gender, age, and responses. Upon completion of the assessment, a personal summary is immediately generated. It shows the health status of the individual, highlights areas in which they are doing well, and provides recommendations in areas in which they can improve. Challenge participants are being encouraged to complete the WellSuite IV Health Risk Assessment at the start of the Seven-Day Challenge and again at the end of the Challenge so they can gauge their pre- and post-Challenge results. For nearly four decades, Wellsource has been personalizing population health by designing innovative tools that are grounded in evidence-based medicine, making us one of the longest serving and most experienced companies in the industry. Wellsource uses the power of technology to drive informed decisions with actionable data. Health plans, employers, care and service providers, and delivery networks use our tools for predicting health risks and reducing avoidable costs. Visit www.wellsource.com to learn more. Engine 2 is a health and wellness company aiming to change the American diet for good through the power of plant-strong living. Founded by #1 New York Times Bestselling Author Rip Esselstyn, Engine 2 provides a range of books, resources, and events to help you live your best, plant-strong life. Visit www.Engine2.com to learn more. Through his seven-day immersions in exotic locales, Rip Esselstyn found that true health transformation can start in just seven days. His latest book, The Engine 2 Seven-Day Rescue Diet, shows readers how to get those same results at home. The online Engine 2 Seven-Day Rescue Challenge launched in January 2017 and has provided support to more than 20,000 people throughout their journeys.